WSPA (World Society for the Protection of Animals) and BRC (Bioresource Research Centre) estimate that around 40-45 bears remain in captivity for use in the brutal blood sport of bear baiting. In March 2014, one more of these long-suffering animals was surrendered to our partners in Pakistan, the (BRC). The male bear was handed over by his former owner in Punjab in exchange for an alternative cruelty-free livelihood, before beginning the eight hour journey to the WSPA-funded Balkasar sanctuary. The new bear is now getting used to his environment in the quarantine area, and the BRC team is watching his progress closely as they do with all new bears. The team expects that he will be released into the main sanctuary enclosure after his quarantine and electric fence training have been completed. The former bear owner was given support to establish and run a general grocery store in his local neighborhood, which he has to keep for at least a year. BRC identified a suitable location, in this case in the village’s main market area, and supplied six months’ rent and some basic renovations. Food items and other common household products were purchased from wholesale shops and arranged on the shelves of this new business. As sign of his commitment to his new cruelty-free alternative livelihood, the owner also signed an agreement that he will never purchase another bear. 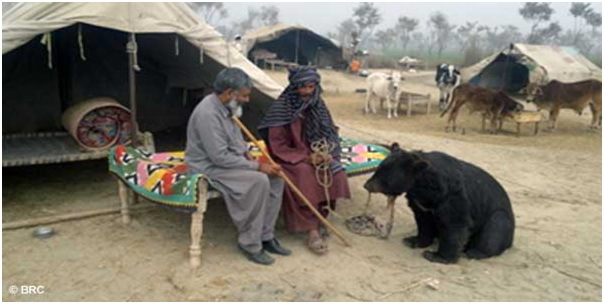 This work is essential to ensure that owners do not simply replace surrendered bears with new bears from the wild, and is a vital part of securing a permanent end to the tradition of bear baiting in Pakistan. 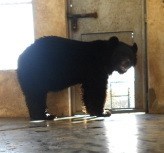 Zorro, a 9 year old male Asiatic black bear, was surrendered in March in the Bahawalnagar area of Punjab province. The marks on the bear’s muzzle and body speak volumes about the hardships of his former life. But despite this he appears to be healthy at weight of 146 kg. When Zorro first arrived at the Balkasar sanctuary, he was given a very thorough health check by the vets who also removed his nose ring. He was then placed in the quarantine area to feed, rest and get accustomed with his new surroundings. Zorro now shares his space with Dora, a bear that was rescued in 2012. When given the all clear from the vets, Zorro will be introduced to the other bears of the sanctuary. The bear’s owner, Aijaz Ali, kept him mainly for use in bear baiting events but he was also forced to dance for several years too. During his life in captivity he was only ever fed with milk and bread meaning that he was constantly hungry and malnourished. The BRC team reached out to Alijaz and helped him to understand the extreme pain and fear experienced by bears during baiting events. They spoke to him about religious, ethical and economic matters and convinced him to adopt a new cruelty-free way of earning. After many visits and lots of discussions, he finally agreed to hand Zorro over to BRC in exchange for support in setting up a general store. first time I heard that animals have rights in Pakistan . I would like to bring in your knowledge people those who are sallying sheep’s and lambs at the road side in different places mostly behind Qaid e Azams mazar they tie up front lags of these animals to keep them standing for hours and hours please do something for them thankyou.